The European Parliament has removed the immunity of the French far-right leader and MEP Marine Le Pen, paving the way for her prosecution in France. French prosecutors opened a case against Ms Le Pen in 2011 after she compared Muslims praying in the streets to the Nazi occupation of France. Ms Le Pen, leader of the National Front (FN), is accused of incitement to hatred and discrimination. The vote followed a move by a committee of MEPs to remove her immunity. The request to do so came from the chief prosecutor's office in Lyon, the city where, in December 2010, Ms Le Pen told FN supporters that the sight of Muslims praying in the street was similar to the Nazi occupation in World War II. In her speech, broadcast by French media, she said that first France had seen "more and more veils", then "more and more burkas" and "after that came prayers in the streets... I'm sorry, but some people are very fond of talking about the Second World War and about the occupation, so let's talk about occupation, because that is what is happening here... There are no tanks, no soldiers, but it is still an occupation, and it weighs on people". Ms Le Pen took 17.9% of the vote in the first round of the French presidential election last year. Praying in the streets was banned in Paris in 2011 in response to growing far-right protests. And in the same year France became the first EU state to ban public wearing of the face-covering Islamic veil (niqab). By some estimates as many as six million French people, or just under 10% of the population, are Muslims, most of them from France's former North African colonies. Speaking to the French broadcaster LCI on Tuesday Ms Le Pen defended her remarks, saying she would lose her parliamentary immunity "because I'm a dissident", adding: "I'm not at all afraid of it, I'm scornful of it". 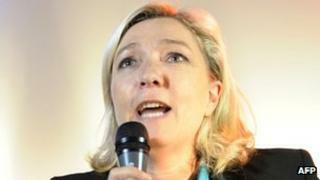 She described the move against her as "intimidation" and said she had "dared to say what all the French people think". Her father, Jean-Marie Le Pen, was formerly the FN leader and has several convictions for racism. The European Parliament stripped him of his immunity in 1997 and he was later fined by a German court for minimising the Holocaust. He had dismissed the Nazi gas chambers as "a detail" in World War II history. Under European Parliament rules, immunity covers MEPs for any opinions they express within the parliament. But the rules say that "immunity cannot be claimed when a member is found in the act of committing an offence and shall not prevent the European Parliament from exercising its right to waive the immunity of one of its members". The Labour MEP Mary Honeyball, who sits on the parliament's legal affairs committee, told the BBC: "Quite rightly, Marine Le Pen will now face prosecution following today's vote. It's taken a long time, but she must now defend her actions in a French court and follow the proper legal procedure which almost nobody else in France has immunity from. She is not above reproach." And another committee member, Conservative MEP Sajjad Karim, said Ms Le Pen "is, and always will be, a polarising politician who seeks only to divide rather than unite". "It is disappointing that she tries to hide behind her EU immunity as she espouses anti-EU and anti-immigration sentiments. Using Nazi occupation in France as a comparison to Muslims praying on the street is appalling, insulting and highly inflammatory," he said. What next for Marine Le Pen's National Front?